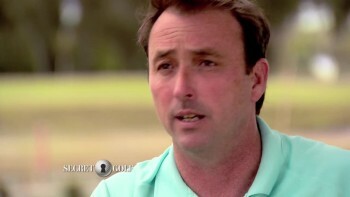 Secret Golf's Calder Chism and Terry Okura step in for Steve Elkington, and visit Daufuskie Island in South Carolina where they discover some history on this mysterious island. NARRATOR: If you're looking for some southern charm with a twist, look no further than Daufuskie Island, South Carolina. A short 30 minute boat ride from Savannah, Georgia carries you to a world steeped in history where time creeps and tales of old and new are woven into local lore. Native legends speaks of curses or spirits that inhabit Daufuskie. -Very strange things have happened over here. It's hard to rationally explain. -I'm a spiritual man, but I also have to believe that there's other things that are happening in this world that we don't understand. -Bloody Point golf course-- there's not too many courses that I'm aware of that actually have a cemetery on their property. NARRATOR: While we'll keep our opinions to ourselves, one thing is for sure. Daufuskie is immersed in mystery, and "Secret Golf" is here to shed some light on what many call the forgotten island. -I don't do boats, and I really don't do jokes, but I sent my team to Daufuskie Island to Bloody Point Golf Club to see the wonderful history of this island and the bringing back to life of this golf course. -He told us that he'd be happy if we took this one, and we were very happy to step in and do it. THEME SONG: It's secret golf. It's what I'm looking for. THEME SONG: That's why I get up every morning, have a good time with friends. What keeps me coming back for more. Secret golf. We're headed down the road. We just [INAUDIBLE]. THEME SONG: Big show. Going looking for the heart and soul. THEME SONG: We'll go until the wheels fall off. It's secret golf. Shh. It's a secret. -It's very peaceful. It's somewhat isolated, hard to get to. You can only get to it by boat. -The history here-- it's very fascinating. You know, the Revolutionary War, Civil War, the [INAUDIBLE] people. Of course, the spirituality aspect of it, too. -There's a magic about it. You know, I'm not quite sure what it is. For me, it's the fact that this is the low country of South Carolina that I grew up in, and in most places it's gone, but it's still live right here in Daufuskie Island. -You do have to have a passion. It is a bridge-less island. You know, virtually everything that you do over here has its challenge. ROGER PINCKNEY XI: The same thing that makes it difficult to live there is the same thing that keeps it remote and keeps it private. You play hell getting groceries, and you don't want to run out of liquor, light bulbs, or toilet paper, but other than that, I mean, it's a blessing to live here. NARRATOR: Daufuskie is Muskegon for sharp like a feather, named for a sand bar that juts out from the southern tip of the island, but Bloody Point got its name from the island's most infamous battle. ROGER PINCKNEY XI: They came down the Mungen River here in canoes. Over there in the new river was a colonial scout boat, and it had two cannons at least we know of, and when the Indians cleared that point, they cut loose with the cannons. Pretty soon there was nothing but red mist and kindling. The sands of the beach literally were red with blood, and it's been called Bloody Point ever since. Well, there's a belief that Daufuskie is protected by the African ancestors because there have been so many things-- uh, very strange things that happened over here that it's hard to rationally explain. -Daufuskie Island is a very spiritual, mystical place. A lot of that is a combination of the Gullah Geechee. It's a combinations of the Indians, and it's a combination of all these things that make this very special and very special when it gets at night, because when it gets at night, it gets very dark-- the Spookiest place you could ever have. -With the actual history there was a lot of more or less unwritten history, even unspoken to some degree. Then we started talking to people about the spirits that are still alive there, the voodoo culture. There's, uh, something called the root, and first rule of the root is we don't talk about the root. TERRY OKURA: You can feel the spirit there. It'll make a believer out of you if you had to walk by yourself. You'll be asking for the friendly ghost to help you. CALDER CHISM: I definitely believe in it enough to not want to mess with it. We'll just leave it at that. -Apparently there's some spirits that live at Bloody Point, and the characters that live there indulge my team in the stories and the resurrection of this great club. Davis Love came in and helped bring this place back to life, and maybe one of our guys may even have got a picture of one. Maybe. NARRATOR: Bloody Point, along with private courses Haig Point and Melrose, make up Daufuskie's golf options. Patrick Ford began as a cart attendant at Haig Point in 2006, but soon after, he would step in the golf pro opening at Bloody Point. -In early '08, the resort was going through some challenges, and I got a phone call to get everything out of the golf shop, and that was the last day that course was open. NARRATOR: As the island struggled with financial uncertainty, Ford's passion kept Bloody Point going. -Every dime that we made went to paying for gas, for fuel for the mowers, so we can just, you know, keep the golf course in-- in a relatively decent condition. So after a couple of months of-- of not getting paid, we had to make a decision. NARRATOR: In the end, Patrick had no choice but to leave Daufuskie only to answer the call to return to Bloody Point six months later. PATRICK FORD: What we came back to was a-- a beautiful piece of property that needed a lot of work. You couldn't see where the water began, where the water ended, because you-- when I'd go down the middle of the fairway, I'd have to put the bucket down to block the dog fennel so I can actually see, and I'd just go down. It kind of reminded me of "The Shining," you know, the maze out back. So you know, I'd just make pass after pass. It took me three full days just to cut the range. -We were familiar with the golf course, but we got there, and it was pretty far gone. I mean, it had been sitting idle for probably three years. We realized that there was a golf course under there somewhere. NARRATOR: Through hard work and dedication from new owner Brian McCarthy and the Love design group, the resulting stunning golf course is fundamentally due to Patrick Ford. MARK LOVE: His passion and his love for that place is so evident from the first time you meet him. It made us want to work hard to try to get it back for him and for everybody else. PATRICK FORD: I love Bloody Point. I wanted to do anything we could to keep it running. I guess the easy way would have been just to go somewhere else. There is a challenge there. Nobody else was going to do it, so I figured why not. -What he's done to the golf course is pretty amazing. -He did it because he loved it. He loved the game, and he loved the course. Patrick's a hero. PATRICK FORD: So here we are at 16th hole Bloody Point. It's one of our signature holes. -He knows the course inside and out, and he was very helpful with yardages and shot shaping, where we should hit it. -So we have a little bit of wiggle room to play it a little bit left to right. If you hit a draw, recommend putting it right over the top of that oak tree. PATRICK FORD: That was poetry in motion. -It's no secret that I'm probably the worst golfer in the group. Get right. And we're in the beach. PATRICK FORD: Bunker's in great condition by the way. -Yeah, I just really wanted to try that. PATRICK FORD: I mean, you haven't been in one in a while. -I don't get a lot of good sand in Reno. ROGER PINCKNEY XI: Look out America. Here we go. ROGER PINCKNEY XI: The ball's out. CALDER CHISM: Nice shot. Go in. Go in. CALDER CHISM: Oh, nice putt. -So what's this going to do? -Well, it's going to go a little bit left to right, a little uphill at first. I would recommend getting it to the hole. -Mm. How'd that not go in? -So this is where smackdown gets him. -As you can see by some of my replacements of my team, they were struggling a little bit with their game. So I've decided to put in something that's going to help everyone's game. Why is it so right now that everyone's having trouble chipping? -Chipping is the reduced size of a swing. -That's all it is. It's nothing new. -Show us how to chip. -Your hips do everything. Your hands do nothing except hold on, and you go where your hips put you. You put the club there and just move it like that. -That's why you have to have your feet in good shape so that your lower body can move. -So what's very important are these little small moves of your legs. -Absolutely. And your hips are doing-- your hips are doing it all. -Well, because it takes your hands out. When you take your hands out of the golf, you'll feel the game in your hands, but you don't hit with it. -They're holding the club, and all that is the feel. It has nothing to do with the shot. -And so if the player would do something with his hands-- your hands are not that strong. Your hips are strong. -So Roger, can you tell us a bit about the Gullah culture? -The Africans who came here came from the west coast of Africa. They found that this climate were very similar to what they knew in Africa. Around the turn of the last century about 1900, well, Daufuskie was a huge producer of oysters that were shipped worldwide, and so it required a huge labor force. And so many of the oyster pickers lived in houses like this, but this is a typical Gullah house that's in a little bit better shape than the other ones. This house is about 1910 I want to say, but what a beautiful old house. I'm so glad somebody has taken interest in it [INAUDIBLE] it's not gonna fall in. Here we have the First Union African Baptist Church. The original building was built in 1881. It was destroyed in a forest fire, and, uh, this building was built in 1886 to replace it, and it's been in continuous use ever since. It, uh-- service is every Sunday. Its, well, 100 and what, 40 years now? Something like that. -You say this is the church house. What about the praise house? ROGER PINCKNEY XI: Each plantation had its own slave chapel, and they would have a place where they would have their time to themselves, and each plantation had its own. There were seven separate slave cemeteries on Daufuskie Island, and five of the sever were on the water. And the Gullah people traditionally buried their dead on the riverbanks. The idea being that the ghost could go up and down the river easier than they could go across the land, and also this would expedite their way to Africa. NARRATOR: The Gullah may have influenced the golf, as well. CALDER CHISM: Good swing. Come back in. Good shot, Terry. Good shot. TERRY OKURA: There you go. CALDER CHISM: Going in would be fun. CALDER CHISM: I think you hit the flag. CALDER CHISM: Oh, look at you. PATRICK FORD: That was pretty. PATRICK FORD: That could be interesting. -My putting has continued to get so bad that I just finally said I've decided I would try to putt from the other side. -Everything breaks away from the Spanish Armada. -Get it putt. Get it. ROGER PINCKNEY XI: Wow. Nice roll. CALDER CHISM: Come on, pro. Close him out. Yes. TERRY OKURA: Bring it to [INAUDIBLE]. -Oh, yeah. Look at this. TERRY OKURA: Poetry in motion. Never saw that coming, but I knew-- I believe in it, though. I really did. That left handed stroke that he has going on. -So are we sure this is the way to the 18th tee box? -Yeah, we should be safe. -We-- we got off the green at the 17th hole, and then he decides to take us through a graveyard on our way to the 18th, which, uh, OK.
-So apparently at Bloody Point Golf Club there's a graveyard on number 17, which my team got to walk through, which pretty much tells you all you need to know about why I wasn't there. -You can see the line to the flag is right up over this oak tree, but if you have any kind of tail on it, it will be in the hazard. -I'm just saying because there's a couple of gators in there. I want to keep you away from that. CALDER CHISM: Why would you want to do that to people? PATRICK FORD: Because it's fun. CALDER CHISM: So that's just a great finishing hole. Going right back to the clubhouse, but a very challenging third shot because it's a very shallow green. Wow. Get up. Go. TERRY OKURA: Big bounce. Big bounce. There you go. That's the one. [INAUDIBLE]. TERRY OKURA: Check. Check. Yes. CALDER CHISM: Nice shot, Terry. Hello. What's it gonna do? PATRICK FORD: Looks like you got a bit of a double breaker. -Get over to the other one. Come on [INAUDIBLE]. -Calder and me had a little problem, but, um, he's always there for us, isn't he? -I went over and helped him read the putt because it was high pressure. We were trying to close out the pro. -I think it's going that way. -Nice putt. Go in. Oh! -Good try, buddy. Go in. All right. -That was fun. That was really fun. Thank you so much. CALDER CHISM: Appreciate you bringing this course back to life for us. -One of the things that we strive to do on our show is to find characters, and oh boy, did my team find one at Daufuskie Island. Check out Low Country Joe. LOW COUNTRY JOE YOUCIS: When you become a local on Daufuskie, you're kind of brought into the environment and the spirituality that's here. Whenever you start getting into that, you start to really understand deep in your soul when it gets right to you. We're different here, all right? We're drawn here for a reason. The house was built in 1883. It's on the National Register of Historic Places. It's one of eight lighthouses in the state of South Carolina. It's one of the handful of lighthouses that are in private hands. A lot of times I'll stand up in that light room, and I will look out over these fairways, and I'll see dancing lights, low dancing blues and greens. They act like dervishes. They hug the trees, and they fly about. Those of the spirits of Bloody Point. TERRY OKURA: He actually took me in to his lighthouse and showed me around, and it was-- it was incredible in there. Really, really warm. I mean, there's no heaters on. Pretty phenomenal. I actually shot a tree, and we think we caught an orb in the picture. CALDER CHISM: Low Country Joe-- he was outstanding. He was more than happy to tell us all sorts of lore and ley lines about energy fulcrums running right through this old winery building right in front of his property. LOW COUNTRY JOE YOUCIS: The ley lines-- they criss cross. The energy lines-- they criss cross around the world. Like Machu Picchu, Stonehenge, uh, the great pyramids, uh, and for the vortex is really where the energy circulates. Watch out. It'll actually pull toward that point and then go around in circles. Watch. See it. Watch it get bigger. I'm-- I'm a spiritual man. You know, I'm a Christian, but I also have to believe that there's other things that are happening in this world that we don't understand, and every time I go in there I believe. TERRY OKURA: If you believe, you're going to see things. If you don't believe, you're not. I went in there with the bias towards believing. You know, he cleansed me with the sage. I think I needed that. -I'll admit it. I felt some-- I'm not sure what it was, but it-- it felt like something, you know? And I got some sage spirit around me, and things started spinning a little bit better, you know? A little-- a Little spiritual tuneup never hurt anybody. LOW COUNTRY JOE YOUCIS: You almost think that maybe because we've been such good caretakers, and we didn't destroy the property, and we took care of it, and I-- and I wore the lighthouse keeper's hat and the uniform and felt in my soul that I was supposed to be the keeper of the past. TERRY OKURA: Nobody asked us if we wanted to come here and meet the ghosts, but I'm glad I did. I'm really glad I did, because, I mean, you know, where do you experience this, honestly? You don't. You don't get to experience this anywhere. CALDER CHISM: It's a beautiful place. It's a special place. I can't explain it. I mean, if I could, then it may lose, you know, some of its charm for me. -It's magic. It's intoxicating. It's addictive. It's one of the last places in America where you can live an unencumbered and free lifestyle, and so we get by just fine, thank you. -I feel a real kinship with that island. I'm, uh-- you know, I'm sad to be leaving. I don't want to leave. I loved being there. I feel like the longer we got to stay there, the more we kind of got to be, uh, you know, members for a few days. NARRATOR: On another episode of "Secret Golf," in an area known for its extremes, no expedition to Death Valley would be complete without a stop to the lowest point in North America. STEVE ELKINGTON: 282 feet below sea level. That's pretty low. This is the lowest in-- in-- in, uh, North America. NARRATOR: Where Elk gets to play tourist. -There's not much to see. No trees. It's just all salt. Have you tried the salt today? Didn't? It's good. It's a different landscape, that's for sure. I sort of knew what I was getting in for. Gonna be out in the big desert. There's gonna be salt flats, and overall, uh, it's a tremendous place to come visit because everyone has a bit of a explorer inside of him. This trip had a few more things to offer than the average trip we do. Will you take my picture? NARRATOR: And has a chance to enjoy a true oasis with some of the locals. STEVE ELKINGTON: Look at this guy. -Does he talk kind of funny, or is it me? -No, I think it's both. NARRATOR: "Secret Golf" with Steve Elkington has been a presentation of Secret Golf Incorporated. Shh. It's a secret.